On the hunt for a great deal on your next mattress in the Boston, Massachusetts area? If you’re not yet comfortable with buying online or basing your decision on our ranking of the top 30 online mattress companies, read through this guide to find where to make your purchase. As the most populous city in all of New England, it’s no surprise that Boston is home to a great number of mattress stores. There is also a wide variety in the market, reflecting the city’s population, from economy beds for students to hand-crafted luxury mattresses for successful business leaders and entrepreneurs. This innovative city even has a demand for novel, high-tech and state-of-the-art sleep systems. Whether you’re searching for a specialty bed, a luxury bed, or simply an affordable non-nonsense mattress, you’re probably wondering which of these stores is the best place to buy a mattress in Boston? We’ve explored a wide range of listings and reviews to narrow down the many options. 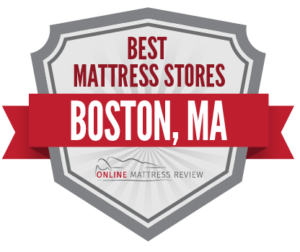 Our selection of the Best Places to Buy a Mattress in Boston highlights some of the top-reviewed options in each geographical areas of the city. Read on to find the ideal mattress store in your neighborhood, whatever your mattress style preferences. While most major cities have no room for mattress showrooms in their downtown areas, there are several mattress shops in Boston, right downtown. Over by Boston Commons, Circle Furniture (31 St James Ave) is another solid option. This locally-owned store has been in the area for 60 years, and sells a variety of high-quality, locally-made furnishings, including chemical-free and sustainable furniture and made-to-order sofas and loveseats, along with a variety of mattresses. The store sells Natural Dreamer mattresses made from sustainable and eco-friendly organic cottons, latex, and wool, as well as their own brand of high-quality, affordable mattresses made with Certi-PUR certified foams, that’s free from chemical fire retardants and other potentially harmful chemicals. Another place to buy a mattress in downtown Boston is Macy’s (450 Washington St). This long standing and reputable department store stocks a number of mattress brands, including Aireloom, Beautyrest, Serta, Stearns & Foster, Tempur-Pedic, and the store’s own brand, MacyBed. Still another reliable place to buy a mattress in the area is Mattress Firm Downtown Boston (45 Franklin St), a highly popular national chain which sells a wide array of name brands in innerspring, memory foam, gel, and adjustable mattresses. Mattress Firm has two store locations in the North Boston area, located just a block apart: Mattress Firm West End (151 Merrimac St) and mattress Firm Westford (160 Littleton Rd). Mattress Firm is the nation’s leading mattress retail chain, and is known for its wide selection and staff expertise. In particular, the chain’s highly knowledgeable staff of “sleep experts” are trained to diagnose and troubleshoot sleep problems by guiding customers to specialty beds that address sleep problems such as back pain, snoring and overheating. The store runs frequent special promotions and seasonal sales, so customers would do well to take advantage of any available promotions. The store also offers a 120-day “sleep happy” guarantee; mattresses may be exchanged or returned, and if a customer finds the same product at a lower price, the store will make up the difference. Customers at both locations give positive reviews to the knowledgeable and patient sales staff, who take their time to help each shopper find the right product. There are few places to buy a mattress in Boston in the far southern part of the city, but a few excellent options can be found just South of the Charles River. Here, DUXIANA Boston (173 Newbury St) sells luxe European bedroom furniture and DUX mattresses, the ultimate European luxury brand. This 90-year-old Swedish company is renowned for what might be termed “artisanal mattresses,” hand-crafted mattresses made from materials of uncompromising quality, including slow-growth European pine, natural hevea latex, and high-thread-count cotton. The company’s signature, innovative “Pascal” inner spring support system requires over one mile of specially-milled, high tensile steel wire for each bed, and reflects intensive ergonomic research, advanced engineering, and traditional Swedish craftsmanship. Not only are a range of comfort and support options available, but customers can actually customize each individual section of their mattress, configuring different support levels for head, body and legs, as well as different supports for each bed partner. According to DUX’s sleep studies, all this adds up to a full additional hour of REM sleep for DUX mattress owners. Along with DUXIANA, Beds Boston Luxury Beds (244 Newbury St) is another excellent place to buy a mattress in Boston if you want the best of the best, and money is no object. The store carries mattress made by Hastens, a Swedish company which has been hand-crafting mattresses since 1852, and Tempur-Pedic, a preferred choice of fine hotels, which conforms to each sleeper’s body weight, temperature and form. They also stock Vispring, a British mattress company founded in 1899 which creates bespoke mattresses from natural materials, including flax, cotton, and wool, and SavvyRest, made from all-organic materials. The store has a five-star Yelp rating, and while reviewers admit that the store’s mattresses are a big investment, they swear by the improved sleep and back pain relief they’ve experienced. Those in search of a more traditional and affordably mattress can try Mattress Firm Backbay (811 Boylston St) less than a block away. With the sizable airport occupying much of the area, there are no mattress stores to speak of in East Boston, with the exception of GM Mattress (319 Meridian St), located in Eagle Hill. This no-frills, mom-and-pop mattress shop sells affordable mattresses in a small, neighborhood shop, along with reasonably priced bedroom furniture. Sleep A Rama (1262 Boylston St) is a locally-owned mattress store in the Kenmore neighborhood which has been in business since the 1960s, and was voted #1 for Best Mattress Store in Boston for Prices and Service by WBZ Boston. The store sells mattress at every price point, including BeautyRest, BeautySleep, Serta, King Koil, and TheraPedic mattresses, as well as a DreamWell economy line with factory direct prices. Sleep A Rama has same- or next-day delivery and offers student specials. With top-notch customer service and affordable prices, the store has earned 116 Yelp reviews with an average of 4.5 stars. Further to the west, Boston Bed Company (1113 Commonwealth Avenue) sells mattresses, box springs, sofa beds, and bed frames at factory-direct prices. This family-owned store has been in business for 35 years, and manufactures all its Thera-Pedic products locally. The factory-direct pricing puts all beds, mattresses and bedroom furniture at 20%-50% below retail cost, making this an excellent destination for an affordable mattress.